In 2014 the Joint Legislative Audit and Review Commission (JLARC) directed its staff to review the development and management of state contracts. Interest in this topic was prompted by problems that arose from several recent high-profile contracts. Staff were directed to evaluate whether the state’s policies ensure that contracts provide good value to the state and mitigate the risks to agencies and the public. State entities in Virginia spent more than $6 billion through contracts in fiscal year 2015, mostly for goods and services related to transportation, construction, and information technology. Several laws and policies govern how agencies procure and use contracts, but the most prominent is the Virginia Public Procurement Act. 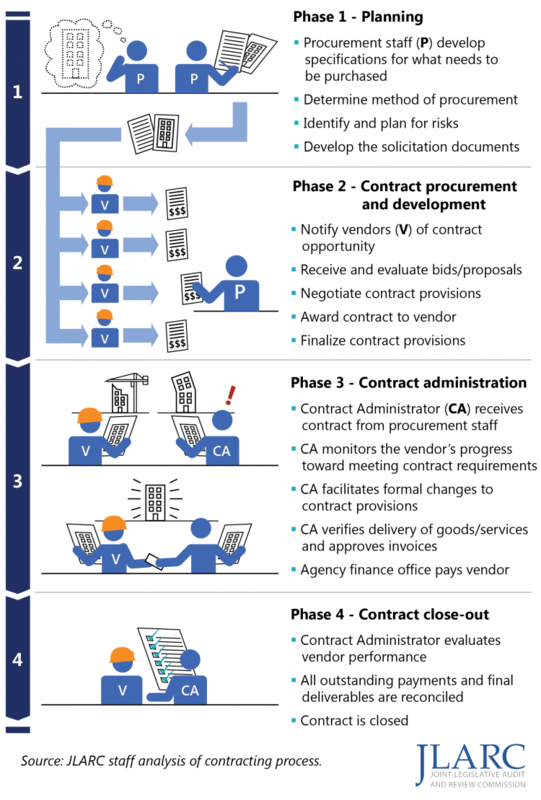 The contracting process is decentralized, as most contracts are procured, developed, and managed by individual agencies. Approximately 10 percent of contracts analyzed for this study—12 contracts valued at $1.8 billion—fell significantly short of meeting agencies’ original expectations. Some less significant deviation from original expectations is to be expected, especially with complex contracts. Almost two-thirds of the contracts were at least slightly behind schedule, over budget, or did not meet agencies’ needs. These contracts were procured under different state statutes and therefore the authority of different oversight agencies. In some cases, the public was negatively impacted. Most performance problems appear to be within the control of agencies or vendors and may therefore be preventable through more robust contracting processes. Certain procurement policies do not help agencies maximize contract value because they do not factor in both cost and quality, or do not provide sufficient guidance on how to use the policies effectively. As a result, state agencies may overpay or receive poor quality goods and services from some contracts. In some cases, agencies have awarded contracts even when they knew the vendor would be unable to provide high-quality goods or services. Purchases made through the small business set-aside program had a modest fiscal impact on the state. Agencies may spend more than necessary on the program because state policies do not provide sufficient guidance on how agencies should evaluate cost when making contract awards. Agencies may also be overpaying for purchases from mandatory sources, which, according to agency staff, are not always of acceptable quality or competitively priced. Some agencies limit competition for some state contracts, potentially increasing the cost or reducing the quality of what they purchase; without competition, businesses have less incentive to maximize quality and minimize price. The state is exposed to legal, financial, and other risks when there is the possibility that contract problems will negatively affect the state or the public. State policies do not require agencies to formally manage contract-related risks, and state training courses on risk management are not widely available. As a result, procurement staff at most agencies do not adequately plan for contract-related risks. According to agencies’ contract administrators, many of the state’s highest-value contracts lack the penalties and incentives necessary to enforce contract provisions. Such contract provisions would give agencies more leverage to address poor contract performance in a manner that benefits the state. State contracting policies focus largely on the procurement of contracts and do not provide agencies with sufficient requirements or guidance regarding the effective administration of contracts. Agencies are therefore ill-equipped to monitor and enforce some of the state’s largest and most complex contracts, which increases the likelihood of contract performance problems. Agency staff are not monitoring contract performance and enforcing contract provisions effectively or consistently, within and across agencies. Vendors are not consistently held accountable for poor performance, and some complex, high-dollar contracts are administered by inexperienced and unprepared staff. The amount of time dedicated to contract administration varies widely and is often only a small percentage of a workweek, even for high-value contracts. Many agencies lack standard procedures for raising awareness about contract-related problems and do not have a clear sense for how their contracts are performing. Most vendors expressed satisfaction with their general experience contracting with state entities but identified challenges with the complaint process. The Virginia Public Procurement Act sets out a formal complaint process for vendors, but it is used infrequently. Many vendors either are not aware of the complaint process or do not understand how to use it. Some vendors are reluctant to file complaints because they fear it could damage their chances of successfully competing for state contracts in the future. Contracting in Virginia is largely decentralized, as most agencies conduct contracting on their own. The Department of General Services (DGS) and the Virginia Information Technologies Agency (VITA) exercise oversight over agencies’ contracting activities, but this oversight is focused on relatively few contracts and does not concentrate on certain aspects of contracting that pose significant risk to the state. Even though contracts account for a significant portion of state spending, the state does not maintain comprehensive information on how contracts are performing. This prevents individual agencies and state-level decision makers from assessing whether their investments in individual contracts have provided value to the state. It also prevents agency staff from avoiding problematic vendors and developing and administering contracts in a way that takes into account previous “lessons learned” at their own agency or other agencies. Develop criteria for identifying high-risk contracts and implement a process to oversee them. Direct DGS and VITA to develop a centralized approach to tracking contract performance. Direct DGS and VITA to develop a comprehensive training program on effective contract administration. Develop tools and policies that allow agencies to balance cost with the quality of goods and services purchased. Develop mandatory training on effective risk management. Develop guidelines for assigning staff to administer contracts, particularly those that are high risk or high value. Develop guidelines for monitoring vendor performance, reporting performance problems, and using enforcement measures. Improve awareness of the vendor complaint process and make it easier to use.